Kaneko, T., et al. Maxillary Sinus Augmentation by Graft-Free Two- Stage Sinus Lift Using Titanium Bone Fixation Device and Implants. (2016) J Dent Oral Care 2(4): 1- 5. © 2016 Kaneko, T. This is an Open access article distributed under the terms of Creative Commons Attribution 4.0 International License. Introduction: Maxillary sinus lift combined with implant placement without grafting allows bone formation in the sinus. However, bone volume in severely atrophic maxilla is often insufficient to ensure initial stability of implants. The purpose of this study was to evaluate the outcome of maxillary sinus augmentation by graft-free two-stage sinus lift using titanium bone fixation device and implants. Materials and Methods: Maxillary sinus lift was performed in 7 sinuses of 6 patients with atrophic posterior maxilla by two-stage sinus lift without grafts. The first sinus lift was performed by a lateral approach using bone fixation device, and second by a crestal approach with implants. Alveolar crest height (ACH) after first and second sinus lift was evaluated radiographically, and implant survival were recorded. Results: The mean preoperative ACH was 3.4 ± 1.3 mm (range, 1.5 - 4.8 mm). After first sinus lift, mean postoperative ACH was 7.3 ± 1.5 mm (range, 3.5 - 9.5 mm). A total of 13 implants were placed in maxillary alveolar crest after first sinus lift, and mean postoperative ACH after second sinus lift with implant placement was 9.4 ± 0.8 mm (range, 8.0 - 11.0 mm). The implant survival rate was 100%. Conclusions: New bone can be generated in space adequately maintained under the elevated sinus membrane, and repeated elevation of the sinus membrane increases the bone volume. Sinus lift by placement of dental implants without grafting materials is a predictable procedure that regenerates new bone around the apex of protruded implants, thus improving implant stability and bone volume in the maxillary sinus[1-8]. However, residual bone volume in the posterior region of severely atrophic maxilla is often insufficient to ensure initial stability of dental implants and may result in the migration of dental implants into the sinus cavity. 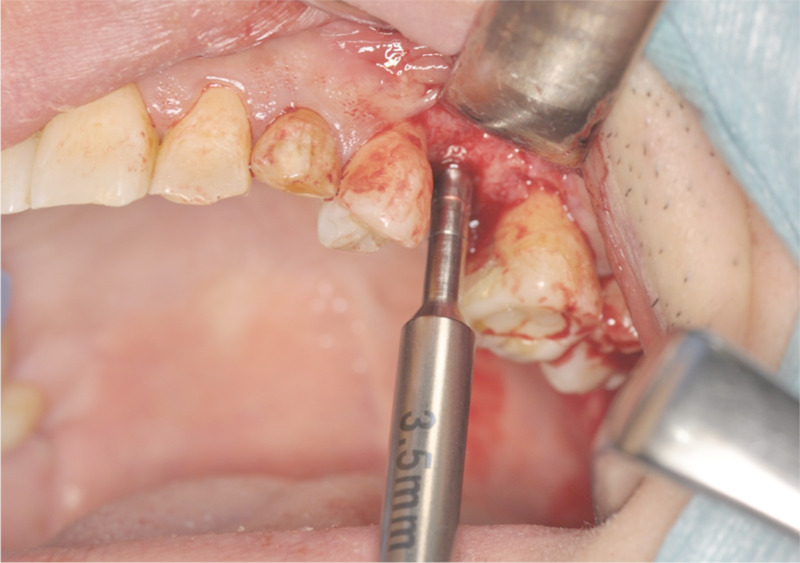 In such severely atrophic cases, adequate bone volume for implant placement can be successfully achieved by performing conventional sinus augmentation through a lateral window technique with grafting materials[1,10,11]. However, if a secluded space can be properly maintained between the lifted sinus membrane and the sinus floor using some device, bone formation according to the same concept as above should occur in the graft-free compartment without simultaneous dental implant placement. This hypothesis has already been proposed by several authors and experimental studies on sinus augmentation using space-maintaining devices with blood clots alone have been reported[12-16]. In our previous study on non-grafted maxillary sinus augmentation, a titanium device for bone fixation showed potential as an adjunctive space-maintaining method for intra-sinus bone formation. In this study, we hypothesized that space-maintenance by using this device only would help to stimulate bone regeneration in graft-free sinus augmentation. However, with or without grafting materials, sinus augmentation in severely atrophic maxilla often presents an undesirable outcome in terms of bone regeneration [12-14,18,19]. To improve insufficient bone regeneration after sinus lift methods, the strategy regarding additional augmentation management to allow placement of dental implants should be considered before surgery. 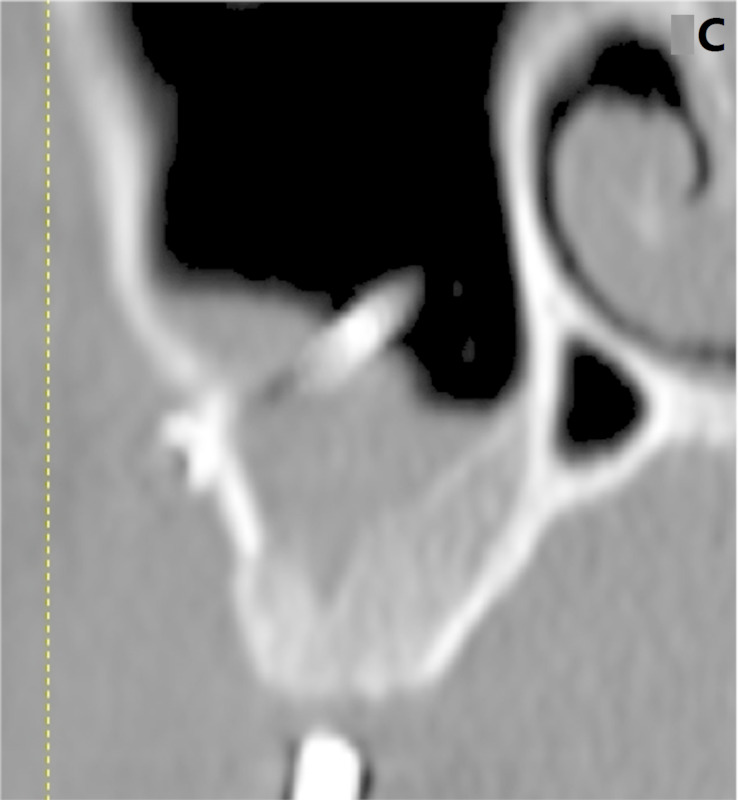 The purpose of this study is to evaluate the clinical and radiographic outcomes of graft-free two-stage sinus lift using a titanium bone fixation device and dental implants in atrophic posterior maxilla, as well as to examine whether repeated elevation of the sinus membrane increases the bone volume in the sinus. The study protocol was conducted in accordance with the World Medical Association Declaration of Helsinki and approved by the institutional ethics committee (registration number 328). All patients were fully informed about the present protocol and provided written consent to participate. To be included in the study sample, patients had to show: atrophy in the posterior maxilla with healthy sinuses, but with the alveolar crest height (ACH) in areas planned for future implantation < 5 mm; no pathology of neighboring teeth, and at least 5 mm crestal width in the posterior maxilla. Patients were excluded from the study if they had a previous history of surgery and/or pathology in the maxillary sinuses. Maxillary sinus floor augmentation was implemented by twostage sinus lift without grafting materials. First, the sinus membrane was elevated by the lateral window approach according to a sinus lifting technique as described in a previous report (Figure 1). After elevation of the sinus membrane, the bone window was replaced and measures for maintaining the space under the elevated sinus membrane were taken using a bone fixation device (Martin Osteosystem 1.5™, Gebrüder Martin GmbH & Co., KG, Germany). 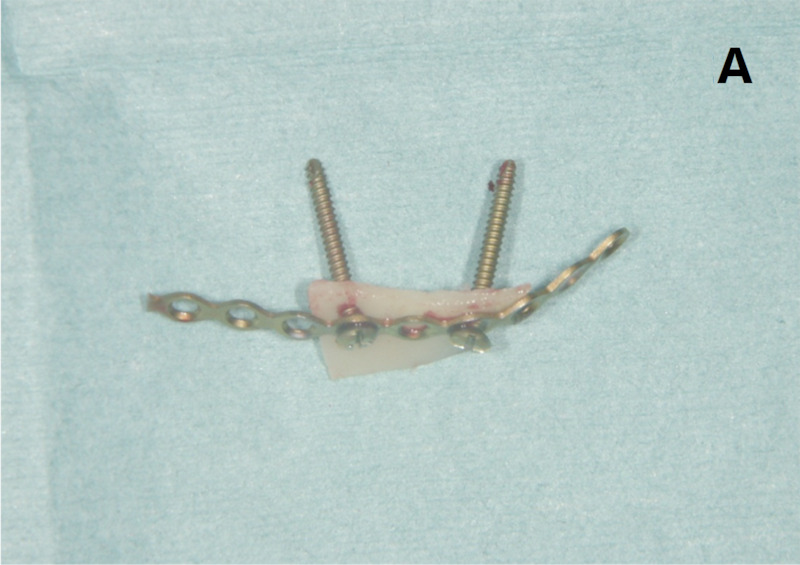 To support the membrane, two long screws 11 - 15 mm in length were initially fixed via a titanium plate to the bone window, and the long screws were left in place protruding from the bone window and the bone fixation device (Figure 2A, B). Because screws at both ends of the titanium plate were blindly inserted, screws of minimum length were used to prevent membrane laceration. Six months after sinus surgery, ACH was evaluated radiographically (Figure 3A, B), and implants were inserted along with a second minimal sinus lift through the crestal approach without grafting materials. 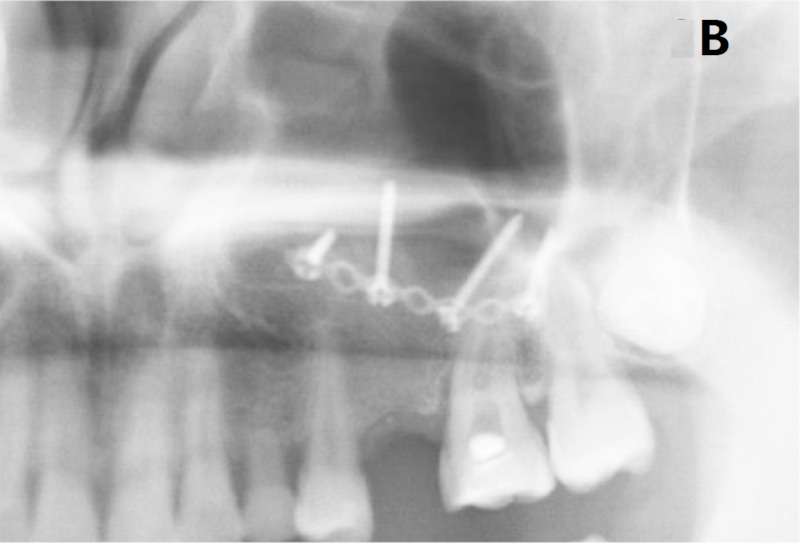 After removal of the bone fixation device, a pilot drill was inserted to a depth of approximately 1 mm below the sinus, and an osteotome was used to perform initial fracture of the sinus floor and Schneiderian membrane elevation (Figure 4). After preparation of the insertion site, an implant (Nobel Replace Tapered Groovy™, TiUnite™; Nobel Biocare AB, Göteborg, Sweden) was inserted through the maxillary ridge into the space created under the elevated sinus membrane. Figure 1: First sinus lift through the lateral approach. A trapezoidal bone window was made in the lateral sinus wall by osteotomy using a piezoelectric device. Figure 2: Reposition of the bone window with the titanium plate. A) Upper view of the bone window with the titanium plate fixed by long screws. B) Clinical view of the repositioned bone window. Figure 3: Pre- and postoperative panoramic radiograph. A) Preoperative panoramic radiograph showing severe atrophy of the maxillary ridge in the area of the retained deciduous tooth. 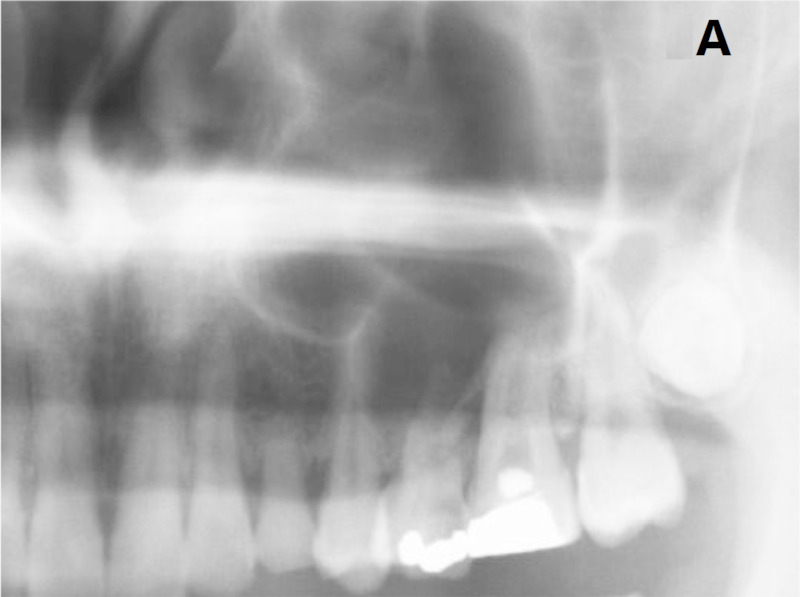 B) Postoperative panoramic radiograph finding at 6 months after first sinus lift. Figure 4: Second sinus lift approach and simultaneous implant placement. Sinus membrane was elevated using the osteotome technique. Abutment connection was performed approximately 4 months after implant placement. After soft tissue healing, 2 single crowns, and 3 fixed and 1 removable dental prostheses were fabricated and loaded. A surviving implant was defined as an implant that was functional and symptom-free. The radiographic examination was performed using a digital panoramic radiograph and computed tomography (CT). Data on pre- and postoperative ACH were calculated on CT reformatted using Simplant Pro™ software (Materialise Dental NV, Leuven, Belgium). Postoperative radiographs were taken at least 2 times at 6 months after the first sinus surgery and at first follow-up after the loading of dental implants. Regarding ACH after implant placement with a second sinus lift, on the buccal and palatal sides in relation to each implant, postoperative bone height from the new sinus floor line to the cervical point at which bone tissue met the implant surface was measured, and the mean value of both sides was regarded as the ACH after implant placement along with a second sinus lift. The surgical technique was performed in 7 maxillary sinuses of 6 patients (2 men, 4 women), with a mean age of 50.2 ± 15.5 years (range, 35 - 71 years). The mean follow-up period after implant loading was 40 ± 16.8 months (range, 20 - 67 months). A total of 13 implants of lengths 10 - 13 mm were placed in the maxillary alveolar crest with sufficient initial stability. The sinus membrane at second sinus lift showed enhanced hardness and was resistant to lifting manipulation. Both after first and second sinus surgeries, wound healing was uneventful, and no intra-sinus problems were reported during the follow-up periods. The cumulative implant survival rate was 100%. The mean preoperative ACH was 3.4 ± 1.3 mm (range, 1.5 - 4.8 mm). 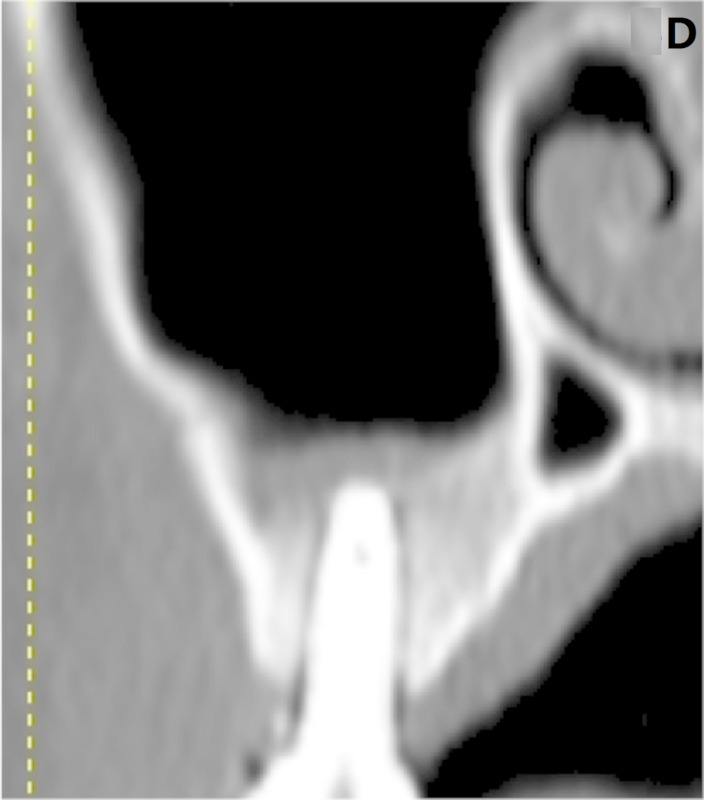 After sinus surgery, CT revealed newly formed dense bone in the sinus (Figure 5A-D). 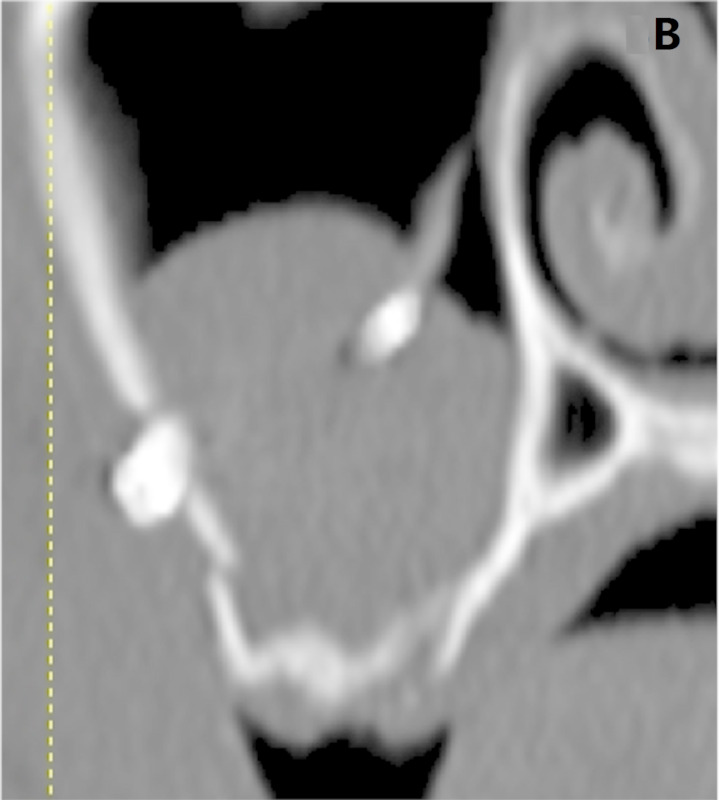 However, in most cases, various- sized exposures of titanium screws into the sinus cavity were detected after the first sinus lift (Figure 5C). Mean postoperative ACH after first sinus lift was 7.3 ± 1.5mm (range, 3.5 – 9.5 mm) and was 9.4 ± 0.8 mm (range, 8.0 - 11.0 mm) after implant placement with a second sinus lift (Table 1). Figure 5: Radiographic findings on cross-sectional computed tomography. A) Before sinus surgery. B) At 3 months after first sinus lift. C) At 6 months after first sinus lift. D) At 6 months after second sinus lift with implant placement. Table 1: Radiographic Measurements: Height of Residual Alveolar Crest, Postoperative Alveolar Crest after First Sinus Lift and after Implants Placement with Second Sinus Lift. The purpose of the present study was to evaluate the outcome of graft-free two-stage sinus lift by space-maintaining management using a titanium bone fixation device and dental implants in an atrophic posterior maxilla. After the first sinus lift, CT findings suggested new formation of bone with intra-sinus soft tissue. After the second sinus lift using a crestal approach, additional medial invasion of new dense bone was observed in the maxillary sinus. Preliminary results suggest that repeated elevation of the sinus membrane increases bone volume in the maxillary sinus. Several experimental and clinical studies have evaluated the possibility of bone formation in the maxillary sinus when performing maxillary sinus floor augmentation using a space-maintaining device with blood clot alone[12-16]. Although a few case series studies using a space-maintaining device such as hollow hydroxyapatite or titanium mesh reported predictable bone formation in addition to favorable histological findings, other studies showed that bone would form in a void space under the elevated sinus membrane even when dental implants were not inserted; however, the regeneration was limited and was insufficient for subsequent implant placement[12-14]. 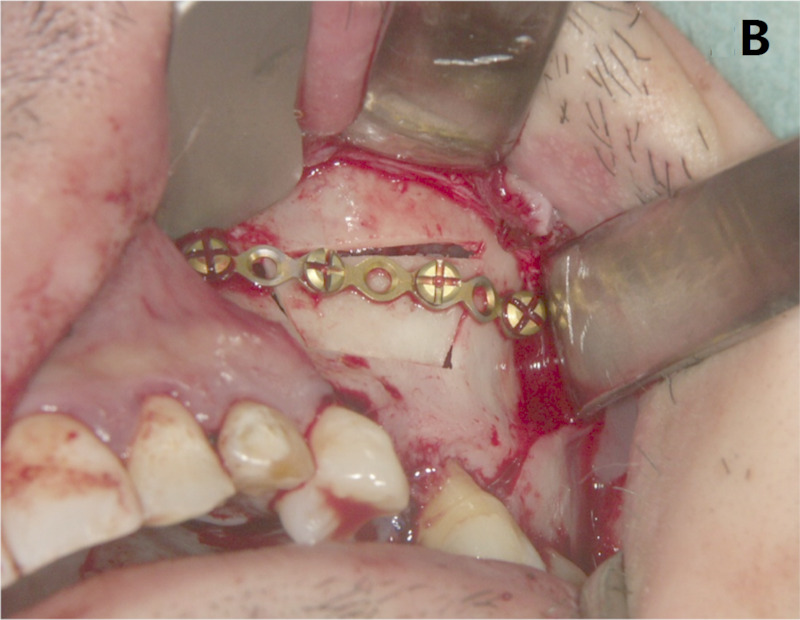 The lack of stabilization of the device under the Schneiderian membrane and membrane perforation of the device[12,13] were the reasons for these unfavorable outcomes. In the present study, the bone fixation device was applied to both reposition the bone window and maintain the secluded space under the lifted membrane. Fixation of the device and lifting of the sinus membrane via titanium screws could be performed with certainty even in the thin lateral wall of the sinus. However, in subsequent radiographic findings, most cases in our protocol showed membrane perforation and perforation of the titanium screws into the sinus. These adverse results in the sinus were in agreement with the findings of an experimental study by Schweikert et al in which a titanium space-maintaining device was used. Unfortunately, as in the above-mentioned studies, we could not gain adequate bone formation to allow for placement of a regular 10-mm-long implant after the first sinus membrane elevation. However, bone formation allowed implant placement in the alveolar crest with sufficient initial stability, and after second minimal sinus lift using crestal approach, there was an additional increase in the bone around the implant apex. This finding indicates that membrane elevation maintained for a certain period can generate new bone in the secluded space under the elevated sinus membrane and repeated elevation of the sinus membrane, which probably triggers additional bone formation, is effective in increasing the bone volume in the sinus. In our clinical experience with the second sinus lift, the sinus membrane exhibited enhanced thickness and hardness that could be a reactive alteration to the first sinus surgery and no perforation was reported. As a result, a crestal osteotome approach could be implemented in each case. In addition, successful outcomes have been reported in recent studies of short implant and non-grafted sinus lifting through crestal approach when residual alveolar bone height is 1 to 5 mm[1,7]. Therefore, the crestal approach in combination with short implants may be predictable and contribute to fewer complications. Repeated elevation of the sinus membrane increases the bone volume. 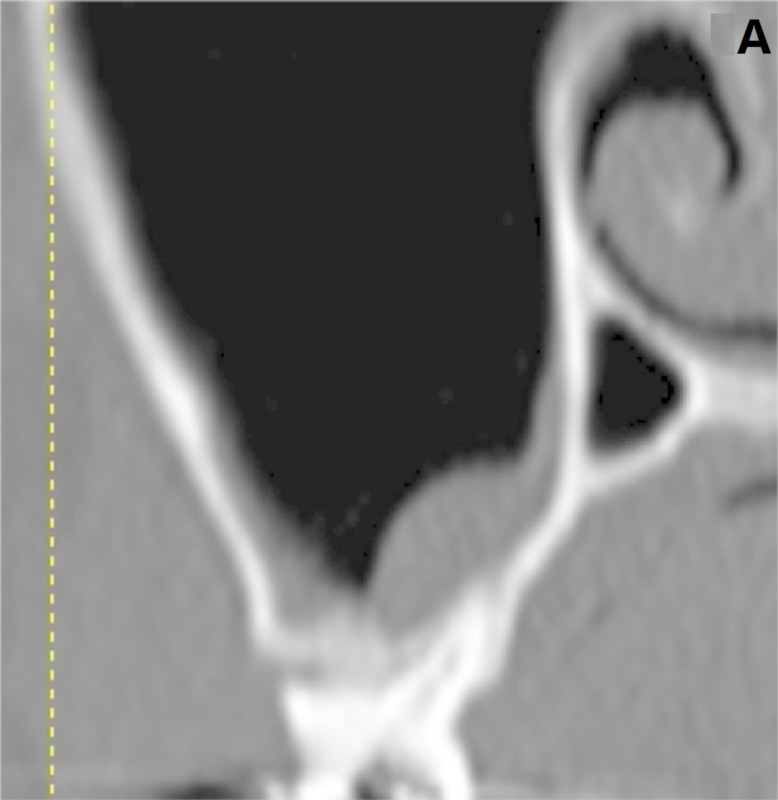 The sequential radiographic findings of bone formation in this study helped to evaluate the predictability of this unique bone augmentation procedure in the maxillary sinus. TK, NH and TS designed the study; TK performed the experiments; SH, YI and IM collected and analyzed the data; TK wrote the manuscript. All authors read and approved the final manuscript. Authors TK, YI, SH, IM, NH and TS state that there are no conflicts of interest. 1. Esposite, M., Grusovin, M.G., Rees, J., et al. Effectiveness of sinus lift procedure for dental implant rehabilitation: a Cochrane systemic review. (2010) Eur J Oral Implantol 3(1):7-26. 2. Lundgren,S., Andersson, S., Gualini, F., et al. Bone reformation with sinus membrane elevation: a new surgical technique for maxillary sinus floor augmentation. (2004) Clin Implant Dent Relat Res 6(3):165-173. 3. Hatano,N., Sennerby, L., Lungren,S.Maxillary sinus augmentation using sinus membrane elevation and peripheral venous blood for implant-supported rehabilitation of the atrophic posterior maxilla: case series. (2007) Clin Implant Dent Relat Res9(3):150-155. 4. Thor,A., Sennerby, L., Hirsch, J., et al. Bone formation at the maxillary sinus floor following simultaneous elevation of the mucosal lining and implant placement of 20 patients treated with 44 Astra Tech implants. (2007) J Oral Maxillofac Surg 65(7 Suppl 1):64-72. 5. Palma, V.C., Magro-Filho, O., de Olivera, J.A., et al. Bone reformation and implant integration following maxillary sinus membrane elevation; an experimental study in primates. (2006) Clin Oral Implant Res 8(1):11-24. 6. Bassi, A.P.F., Pioto, R., Faverani, L.P., et al. Maxillary sinus lift without grafting, and simultaneous implant placement: a prospective clinical study with a 51-month follow-up. (2015) Int J Oral Maxillofac Surg 44(7):902-907. 7. Nedir, R., Nurdin, N., Khoury, P., et al. Osteotome sinus floor elevation technique with and without grafting material in the severely atrophic maxilla. A 1-year prospective randomized controlled study. (2012) J Clin Oral Implants Res 24(11). 8. Cricchio, G., Sennerby, L., Lungren, S. Sinus bone formation and implant survival after sinus membrane elevation and implant placement: a 1-to 6-year follow-up study. (2011) Clin Oral Implants Res22(10):1200-1212. 9. Galindo-Moreno, P., Padial-Molina, M., Avila, G., et al. Complications associated with implant migration into the maxillary sinus cavity. (2012) Clin Oral Implants Res23(10): 1152-1160. 10. Pjetursson, B.E., Tan, W.C., Zwahlen, M., et al. A systematic review of the success of sinus floor elevation and survival of implants inserted in combination with sinus floor elevation. (2008) J ClinPeriodontol35(8 Suppl):216-240. 11. Tan, W.C., Lang, N.P., Zwahlen, M.,et al. A systematic review of the success of sinus floor elevation and survival of implants inserted in combination with sinus floor elevation. Part II: Transalveolar technique. (2008) J Clin Periodontol35(8Suppl):241-254. 12. Cricchio, G., Palma, V.C., Faria, P.E., et al. Histological outcomes on the development of new space-making devices for maxillary sinus floor augmentation. (2011) Clin Implant Dent Relat Res13(3):224-230. 13. Schweikert, M., Botticelli, D., de Oliveira, J.A., et al. Use of a titanium device in lateral sinus floor elevation: an experimental study in monkeys. (2012) Clin Oral Implants Res23(1):100-105. 14. De Oliveira, G.R., Olate, S., Cavalieri-Pereira, L., et al. 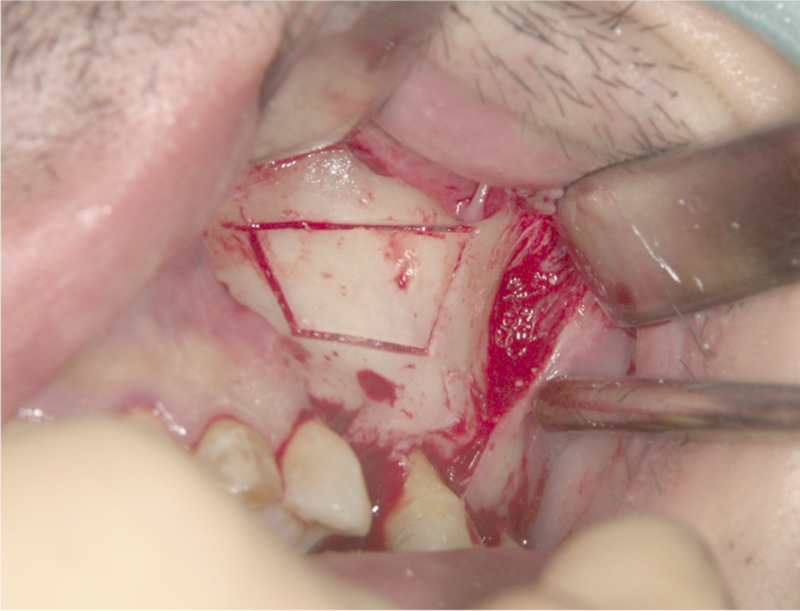 Maxillary sinus floor augmentation using blood without graft material. Preliminary results in 10 patients. (2013) J Oral Maxillofac Surg71(10):1670-1675. 15. Johansson,L-A., Isaksson,S., Adolfsson,E., et al. Bone regeneration using a hollow hydroxyapatite space-maintaining device for maxillary sinus floor augmentation – a clinical pilot study. (2012) Clin Implant Dent Relat Res14(4): 575-584. 16. Atef, M., Hakam, M.M., Elfaramawey, M.I., et al. Nongrafted sinus floor elevation with a space-maintaining titanium mesh: Case-series study on four patients. (2013) Clin Implant Dent Relat Res 16(6): 893-903. 17. Kaneko, T., Masuda, I., Hori, N.,et al. New bone formation in nongrafted sinus lifting with space-maintaining management: a novel technique using a titanium bone fixationdevice. (2012) J Oral Maxillofac Surg70(3):e217-224. 18. Schwartz-Arad, D., Herzberg, R., Dolev, E. The prevalence of surgical complications of the sinus graft procedure and their impact on implant survival. (2004) J Periodontol75(4):511-516. 19. Mardinger, O., Nissan, J., Chaushu, G. Sinus floor augmentation with simultaneousimplant placement in the severely atrophic maxilla: Technical problems and complications. (2007) J Periodontol 78(10): 1872-1877.